rotherham business news: News: "Don't sell South Yorkshire down the river on HS2"
News: "Don't sell South Yorkshire down the river on HS2"
South Yorkshire MPs are continuing to get their message across to the Government that the recommended changes to the HS2 route do not make sense - for the region or the country. The HS2 line to Leeds would travel east of Rotherham following the M1 and M18 before heading through the Dearne Valley. Consultation is taking place before a final decision is made later this year and Ed Miliband, MP for Doncaster North secured a debate in the House of Commons to question the Department for Transport on what changed for a new route to be announced "out of the blue," and to put forward the arguments against the new route. 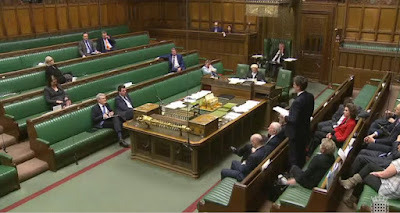 The debate, which did not begin until after midnight, was supported by South Yorkshire MPs, including Rotherham MPs - John Healey, Kevin Barron and Sarah Champion who are backing previous plans for an HS2 station at Meadowhall. Miliband focused on the case that HS2 is putting forward for the M18 route that the Government is minded to accept, arguing that it is worse than the Meadowhall route for equity, connectivity, capacity and journey times. With trains on the spur to Sheffield set to be half the length of HS2 trains and only two per hour rather than five at Meadowhall, the MP stated that the new option offers only one fifth of the capacity of the ​original Meadowhall proposal. The Meadowhall route would mean a journey time into Sheffield Midland from London of 79 minutes, even with a change of trains. The time on the new route is somewhere between 85 and 87 minutes. HS2 Ltd state that the M18 route is some £900m cheaper but Miliband argues that this was "illusory" as it does not include a northern loop from Sheffield Midland to Leeds (around £300m), the cost of a parkway station, (anything from £200m to £300m), electrification of existing routes, and any re-engineering of Sheffield Midland station. He added that the Government's own figures have estimated that operating costs on the M18 route could be some £1.7 billion higher than those of the Meadowhall route. Miliband also discussed the lack of consensus in South Yorkshire which led to HS2 Ltd looking again at routes. He also revealed that Transport for the North (TfN), the body which brings together representatives from across the North and wants to see improved links between Northern cities, had not expressed a view about which option was better and said that it was disingenuous to claim that TfN had driven the change of routes. Ed Miliband, MP for Doncaster North, said: "Whatever the reasons for this bad recommendation, I want the Minister to listen to what he is hearing - the facts and the evidence - and not sell South Yorkshire down the river. "I want HS2 to work for South Yorkshire, but the M18 route does not work. The answer, in my view, should be to return to the original Meadowhall route, by all means with better connections to the centre of Sheffield. "If reason and rationality matter, the M18 route cannot go ahead; if making our country more equal matters, the M18 route should not go ahead; and ​if the views of the people of South Yorkshire matter, it cannot go ahead. I hope and trust that the Minister and his Secretary of State will listen and act when the time comes." Tansport minister, Andrew Jones said that there were "issues to resolve in South Yorkshire." He said: "HS2 is going ahead. The programme is moving at pace. The question is how to minimise the disruption during the build and, most importantly, maximise the benefits when HS2 arrives. I want people to be thinking about that, including in South Yorkshire. "I have met colleagues from South Yorkshire, and I will meet them again — I think that dates are already in the diary; I am happy to receive all representations. I think that we can take this debate as part of the consultation exercise, and I hope that we can achieve a consensus around the proposal in South Yorkshire." The consultation on the proposed changes to the route ends on March 9. HS2 Ltd is holding a number of information events for local residents this week.